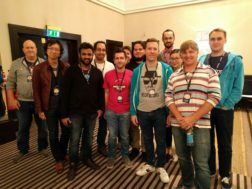 From June 13 – 17, more than a thousand Mozillians descended on London to celebrate the accomplishments of the past six months and collaborate on priorities for the latter half of the year. The add-ons team and a handful of volunteers did just that, and we wanted to share some of the highlights. We celebrated the fact that review times have dropped dramatically in 2016. Last year, most add-on submissions got clogged in the review queue for 10 or more days. Now, 95% of submissions are reviewed in under five days (84% in less than 24 hours!). This is a huge boon to our developer community and a great credit to our tireless, mostly-volunteer review team. Review efficacy should continue to trend positively over the balance of this year. We furthered plans to simplify the review process by eliminating preliminary reviews, among other streamlining initiatives. … A WebExtensions Advisory Group has been formed. This cross-disciplinary body is primarily tasked with providing input around the development of future APIs. … We saw some inspired demos, like runtime.connectNative, which will allow add-ons to communicate out of process; and the auto-reload function for WebExtensions (set to land in 49); plus a demo of a hybrid add-on that allows an SDK add-on to embed a WebExtension add-on, allowing developers to start using the WebExtension API and migrate their users. … Prioritized future work for WebExtensions was solidified, including permissions support, Chrome parity support for top Chrome content, and end-to-end automated installation testing. It’s worth recognizing all the diverse ways our community contributes to the success of add-ons—coders, content reviewers, curators, translators, tech writers, evangelists, student ambassadors, and more—our community is integral in providing Firefox users with the power to personalize their Web experience and AMO’s ability to support a massive ecosystem of more than 32,000 extensions and 400,000 themes. One of the focal points of our community discussions in London was: How can we do more to move volunteers up the contribution curve, so we can nurture the next generation of leaders? What more can we do to turn bug commenters into bug fixers, developers into evangelists, and so forth? Check out the notes from this session and add your ideas there! On the editorial side, we started exploring ways of re-thinking content discovery. Of course we have the AMO site as a content discovery destination with more than 15 million monthly users, but research tells us the majority of Firefox users hardly know what an add-on is, let alone where to find one. So how can we introduce the wonder of add-ons to a broader Firefox audience? A general consensus emerged—we need to take the content to where the user is, to key moments in their everyday Web experience where perhaps an add-on can address a need. This is just one of the projects we’ll begin tackling in the second half of the year. If you’d like to get involved, you’re invited to join our weekly public UX meeting. To get involved with the add-ons world, please visit our wiki page, or get in touch with us at irc.mozilla.org in the #addons channel.